Over the past few years I have been getting many questions regarding the creation of selections in Photoshop as an essential part of my black and white photography workflow. I have answered most of these questions in a three part tutorial, where I gave an in-depth insight on how to create selections in Photoshop with all kind of tools. You can read them here: part 1, part 2, part 3. In this tutorial I will cover the most essential part of handling selections in Photoshop: how to save and manage them. This is a part that is intended for people with very basic Photoshop knowledge or none at all and who struggle with getting used with my Black and white iSGM post production workflow, since creating and managing selections is a very important part of my Black and white photography processing workflow. I already discussed this topic of managing selections briefly in part 1 of the Selections tutorial, but there is still a lot of confusion about this subject. In this tutorial I will go a little deeper into the matter. If you are familiar, or trying to get familiar, with my black and white processing workflow then you will see that I always start with the creations of selections first, before I start the real and more interesting part of the black and white photography conversion. But before I even start with creating selections I always first create a duplicate of the original file. 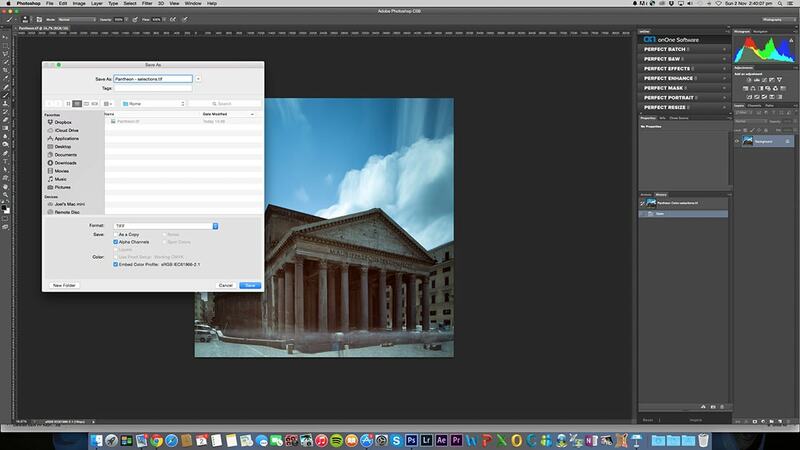 Let’s say I am working on an image of the Pantheon (Rome, Italy). 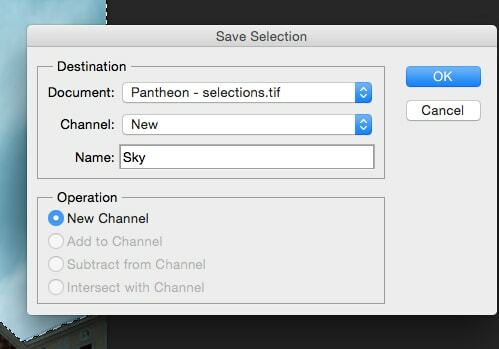 I open my original file “Pantheon.tif” and save it as “Pantheon – selections.tif”. I choose that name because I use that file primarily to save my selections in. You, of course, can choose whatever name you like. I very rarely save the selections in the black and white versions in progress since that will take up a lot of disk space and will also affect the performance of the computer processing. I prefer to create them from the original colour image and save them separately in the colour image only. This applies to both so called ‘hard selections’ (selections created with a selection tool like the quick selection tool) and the luminosity mask selections. When working on the actual Black and white post processing I simply load the selections from the original colour file. 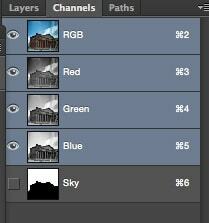 Which means you have to open the original colour file too in Photoshop while working on the black and white photos. So, the first step is to save a duplicate of the original. 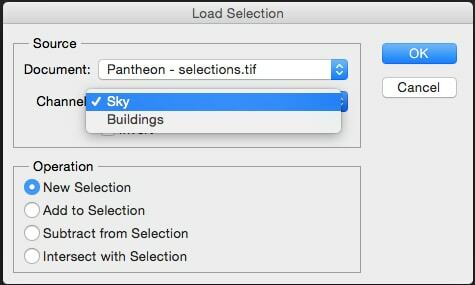 Give it a convenient name, like “Pantheon – Selections.tif” . Now you have two files: the original and the copy. The reason I do this is to always have a backup of the original. It is really easy to accidentally press the wrong button and mess up your original file. Once you have created a copy, open that duplicate and start working on your selections in that file. The first thing I do when creating a selection, is to start with a very quick and rough selection. My preferred tool for this is the Quick Selection Tool. You literally create a selection in seconds. Once you have done this, save the selection. Go to Select –> Save Selection. Give the selection a proper name, so that you will know what the selection is about. I have been selecting the sky, so I will call this selection “Sky”. Again, you are free to call it whatever you like, but if you are working with a dozen selections at the same time, proper naming will keep things organised. You can save a selection by going to “Select” –> “Save Selection”. Remember to give the selection an easy to remember name. This will make working with selections so much easier. In this example I used the name “Sky”, because I am working on a selection of the sky. You can also find your selection under the Channels menu. I will go deeper into this later. Also make sure to save the entire document. If Photoshop crashes you will loose your progress on the selection, even if you have saved the selection. So always make sure to save the document too after you have saved the selection. To save the document go to “File” –> “Save”. Your selection is probably not done yet. It can actually take quite a while before your selection is finished, depending on the tools you use and the complexity of the subject. This means you will have to adjust the selection. The thing is, when you adjust a selection it will not automatically save the changes you have made to that selection. You will need to overwrite these changes manually. Let’s say I have refined the selection a bit (by first loading the saved selection and then adjust it, please refer to my previous tutorials on selections) and I want to save the progress. Simply go to “Select” –> “Save Selection” and choose the selection you wish to overwrite under the “Channel” menu. To save the progress on your selection choose the selection you have been working on in the “Channel” dropdown menu. In this case I tuned the “Sky” selection a bit and I want to save this progress. 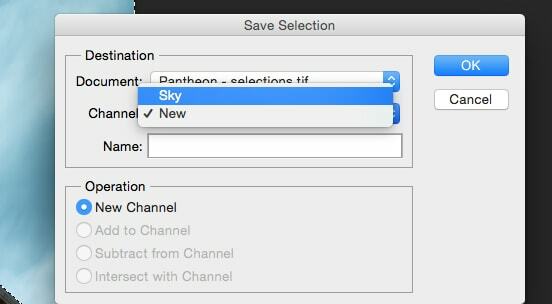 So I simply select “Sky” under “Channel” and press “OK”. I have now saved my progress on the “Sky” selection. Also make sure to save the document again. If you don’t, you will lose your progress if Photoshop crashes. As I said before, creating a selection can be time consuming. This means a lot of readjusting and saving selections and saving documents. I usually save my selection and document every 10 or so minutes. 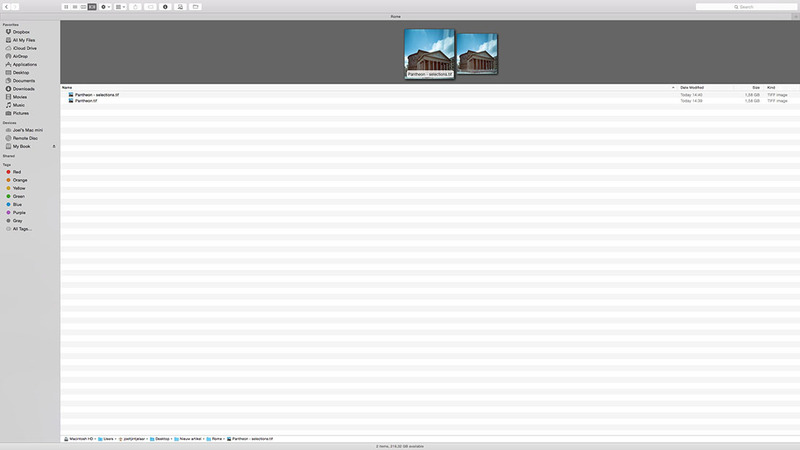 The problem with working with selections is that the file size increases with every new selection. Increased file size means a higher risk of Photoshop crashing. That is why I save so often. After you have finished a selection, you might want to work on another one. Before you start working on a new selection, make sure no current selections are active. Go to “Select” –> “Deselect”. Now you can start with a fresh selection. When starting a new selection make sure no current selections are active by deselecting under the “Select” menu. To save a new selection, just follow the previous steps. After you have made the initial rough selection go to “Select” –> “Save Selection”. Saving another selection is real easy. Just go to “Select” –> “Save Selection”. Again, give the selection a proper name. This time I selected the buildings, so I am naming this selection “Buildings”. Also make sure to save the document after you have saved the selection. If you have multiple selections and you want to adjust a certain selection, go to “Select” –> “Load Selection”. This will prompt a new window. Under “Channel” choose the selection you want to work on. To switch between selections, you will need to load the selection you want under “Select” –> “Load Selection”. It will prompt this window. Select the selection you want to work on under “Channel”. Another way to work with a selection is by using the “Channels” panel. You can usually find this panel on the right side of your screen next to the “Layers” panel. Click on the tab “Channels” to access this panel. If you don’t see this panel go to “Window” and select “Channels” to activate this panel. Under the “Channels” panel you will find all of your selections you have been working on and that you have saved, either via the normal selections procedure as described above or by creating a selection directly in the channels panel. Again, please refer to the previous tutorials on selections where you will find more info on creating selections in other ways than just with the quick selection tool. If you click on one of these channels you can work on your selections too. In this case I can click on the selections “Sky” or “Buildings”. Here I clicked on the “Sky” channel. 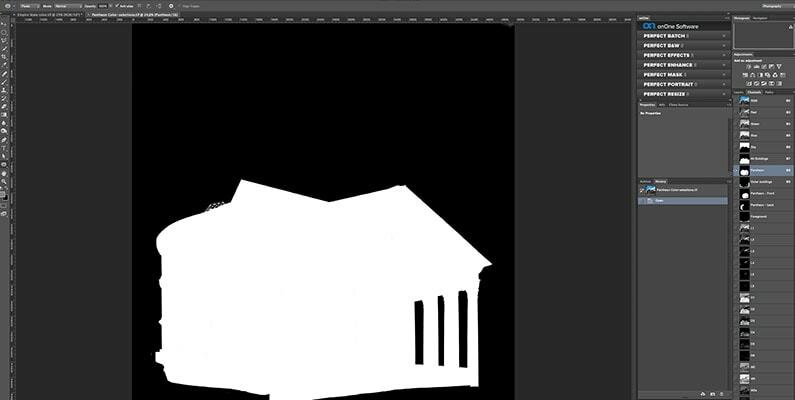 The selections shows up as a black and white image that you can adjust with the brush tool. With a white brush tool you conceal parts of the image, with a black brush you reveal. If you are working with channels make sure that you do not have any selections active by deselecting. Go to “Select” –> “Deselect” before you start working with channels. To save progress in Channels you only have to save once by saving the document. Go to “File” –> “Save”. 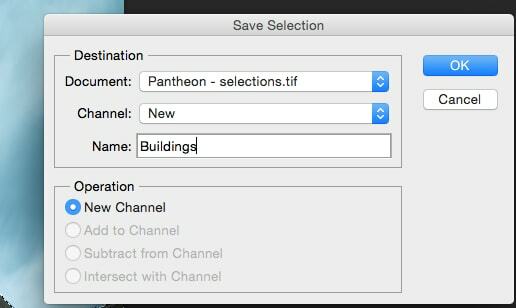 If you are working with Channels you do not need to save the selection through “Select” –> “Save Selection” separately. The advantage of working with Channels is that you can see the selection you have created in more detail. This way you can spot mistakes easier. To exit this view, just click on RGB. The same process of managing selections can be used for the so called luminosity mask selections. The creation of luminosity mask selections will be discussed in a separate tutorial and both hard selections and luminosity mask selections play a very important part in my Black and white photography post processing workflow. The most important thing when working with selections is to save often. Always save the document too after you have saved the selection. In order to keep things easy also be sure to give convenient names to your selection. This way you will not get confused when you are working with multiple selections. More info on my black and white photography post processing method can be found in the The 424 pages eBook From Basics to Fine Art – black and white photography, architecture and beyond, written by me and co-author Julia Anna Gospodarou or in my 2.5 hour B&W long exposure masterclass video tutorial with an extensive explanation on my iSGM (iterative Selective Gradient Masking) black and white photography processing method.